UW's Wagner dances through the top of the zone and gets a shot on Jones, who holds. 11:33 left in the third, PSU leads UW 1-0. Wagner shoots from high slot into Jones' chest and the PSU goalie holds for the whistle. 11:33 left in the third. 1-0 PSU. Kunin gets off a quick release finding a loose puck below right dot after faceoff scramble. Saved. Penn State looks content to take icings here in the third period. Fatigue starting to become an issue? 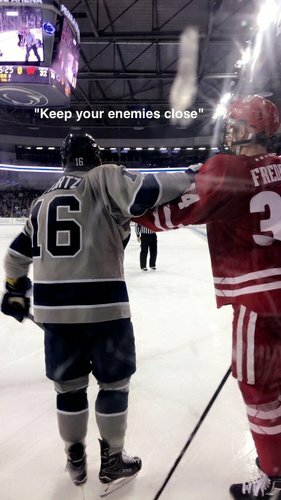 Penn State's Autio gets called for a penalty on Wagner with 8:40 left. Wagner slow off the ice ... maybe got a knee to the head on the play. Wagner gets tripped up and #Badgers will go on the power play. 8:40 left in regulation. UW trails 1-0. #Badgers go on their second power play of the game, trailing Penn State 1-0. BADGERS GOAL: Matt Ustaski scores on the power play, a rebound of a Kunin chance, and it's 1-1 with 8:15 left. Power play goal for Wisconsin on the rebound by Ustaski as he pokes the puck home as Jones couldn't see it and we are tied 1-1 at 11:45. Kunin and Hughes with assists on Ustaski's goal. 1-1 at 11:45 of third. Penn State called for icing with 6:41 left, and the Nittany Lions call timeout, or so it appears. Jones knocks a Frederic one-timer out of play with his blocker. 6:11 left in a 1-1 game. Trent Frederic with one time blast on the rush after pass by Kunin. Jones makes the save. UW's Jake Linhart drives into the zone and puts a shot on net that Jones smothers. 4:17 left in the third, 1-1. 4:17 left in the third. 1-1. 28-22 shots for Bucky. Linhart shot is stopped for whistle and media timeout. Wrap and big scramble around PSU goal. Puck sat right on the line against the post. UW's Malone tries to stuff the puck in at the post but is denied by Jones. 3:49 left. Will Johnson shot gloved by Jones. 3:36 left in regulation. Frederic shot through slot is blocked out of play. 2:21 left in regulation. 1-1. Jones holds after stopping a Linhart shot from the right point. 20.6 left. Faceoff in PSU's end. #Badgers Linhart stopped and held by Jones for PSU. 20. 6 left in regulation. 1-1. 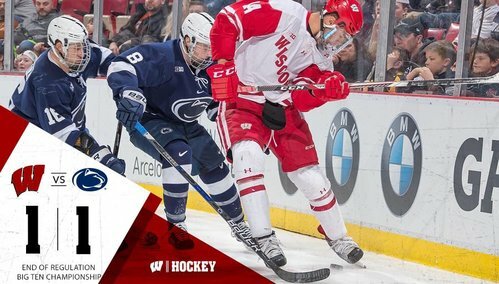 END 3: Wisconsin and Penn State are tied 1-1. Overtime for the Big Ten championship. Overtime needed to crown a champion. Penn State's Alec Marsh is down on the ice near UW's net after the horn, being attended to. Looks like a right ankle injury. #Badgers outshot Penn State 18-5 in the third period and tied the game at 1-1. Unofficially, shot attempts were 27-11 in favor of UW in the third period. Shots on goal 18-5. As we said last intermission, in 2014 Big Ten title game, UW never led until OT GWG by Mark Zengerle. Overtime has started at the Joe. Badgers and Penn State tied 1-1. Berry holds onto a long shot with 17:44 left. A bit past five minutes into OT. We are still tied, in case you were wondering. 12:21 remaining in the overtime period and we are still tied 1-1!